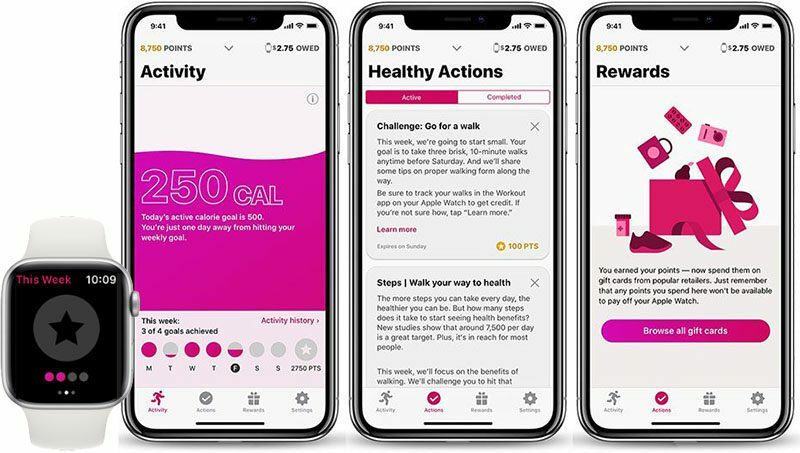 Aetna, the third-largest health insurance provider in the United States, today announced the upcoming launch of Attain, a personalized well-being app for iPhone and Apple Watch created in collaboration with Apple. Through the use of an Apple Watch, the Attain app will provide Aetna members with personalized goals, track their daily activity levels, and recommend healthy lifestyle choices. For completing these actions, participants will earn points, which can be put towards the cost of an Apple Watch or gift cards. Attain will motivate participants to complete personalized daily and weekly activity challenges based on their age, gender, and weight. Attain's definition of activity includes walking, running, swimming, yoga, and other activities that can be tracked in the Workout app on the Apple Watch. The app will also prompt participants with healthy action notifications, including reminders to meet activity goals, get vaccinations such as the flu shot, refill medication prescriptions, visit a primary care physician if they have not had a recent office visit, and more, according to Aetna. To participate in the program, Aetna members will need an iPhone 5s or newer and an Apple Watch Series 1 or newer. Attain participants will have the option to share their health data with Apple, enabling Apple and Aetna to collaborate and continue to improve the program. Through analytics and machine learning, Aetna says the collaboration will lead to new features for Attain, including more personalized recommendations. Every day, we receive emails and letters from people all over the world who have found great benefit by incorporating Apple Watch into their lives and daily routines. As we learn over time, the goal is to make more customized recommendations that will help members accomplish their goals and live healthier lives. Attain is a completely voluntary program in which members determine what information they want to share and can discontinue using the app at any time. All health data is encrypted on the device, in transit, and on Aetna and Apple's servers, where it will be stored with industry-leading HIPAA-compliant security practices. Information from this program will not be used for underwriting, premium, or coverage decisions, according to Aetna, which was acquired by CVS Health last year. Instead, the idea seems to be that healthier customers will result in Aetna receiving fewer insurance claims, thereby saving it money. Aetna expects the Attain app to be available in the App Store in Spring 2019. Interested members can sign up at AttainbyAetna.com to be notified when the app becomes available for download in the coming months. In 2016, Aetna offered the Apple Watch free of charge to 50,000 employees. Yeah sure. Remember how Facebook said they were going to keep WhatsApp as a standalone product…? Hand information on my daily habits to my health insurance company. Gee, what could go wrong with that? "Attain's definition of activity includes walking, running, swimming, yoga, and other activities that can be tracked in the Workout app ('https://support.apple.com/en-us/HT207934') on the Apple Watch"
I wouldn't get any work done if I did everything my Apple Watch demanded. It's already becoming a digital version of a nagging wife. I love it how Apple & their algorithms think I have nothing better to do than leap & prance around the office & home all day long. An up to the minute log of everything you do health wise, spoon fed direct to your insurance provider. Yeah, this is no cause for concern at all. Personally I find the stand goals helpful as I lose track of time about how long I sit at a desk job. Otherwise, you can turn the notifications off. I don't see the issue. Unlike a nagging wife, you can turn those notifications off. As a physician, I will be perfectly frank and say that Aetna can literally go £$&? itself. They are consistently the one company that goes out of its way to screw their customers and prevent care from being delivered. I'd say that for me, the best thing about my Apple Watch Series 3 is to close the rings every day. However, why would you share this sort of information with anyone (not specifically this company) who could call you out for it later ?